As New Zealand First learned the hard way from its two previous periods in government, small parties in MMP coalitions get blamed for the unpopular stuff done by their senior partner in power, but no one remembers the good stuff the junior player brought to the table. NZF has been part of government twice, and got kicked out of Parliament entirely both times, afterwards. With that history in mind, Regional Economic Development Minister Shane Jones has made it clear that he’s going to be saying really, really loudly what he and Winston and the rest of the NZF crew are doing. Just so we’ll know for sure who did what. For that reason… New Zealand First isn’t going to use namby pamby words like ‘work scheme’ or ‘job creation programme’. Jones is saying WORK FOR THE DOLE, as if he means business. And if he says it loud enough, even the old timers who double ticked for Winston will get the message and know that he intends giving those lazy young bucks a good kick up the backside. Get ‘em off the sofa. Put ‘em to work, or else. Got it? This has been Shane Jones, sergeant major of regional development, over and out. Oh, there is one small extra point. Of course, he’ll have to run all the fine details past the sheila who’s really running the show but so far… she’s been a really good sport about it. 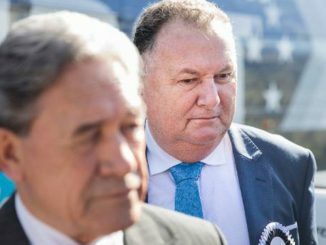 At yesterday’s brief post-Cabinet press conference PM Jacinda Ardern underlined that the details of what Shane Jones has in mind were yet to be hammered out but hey… what’s in a name? WINZ sanctions, Ardern said, already exist to penalize job seekers who don’t comply with a reasonable job offer. So there’d be nothing new if people happened to lose their benefit for not taking up one of those forestry schemes jobs that Jones has in mind. But let’s all wait and see. Details forthcoming. We are going to be seeing a lot of this sort of thing… as what look like stark policy contrasts between the coalition partners get sandpapered by spin into mere differences in labeling. Look closely enough at black and you’ll see a quite surprising amount of white in there. We will all have to learn how to focus. Who knew that Labour/Green concerns about irrigation schemes could co-exist with Jones’ interest in pursuing some of them? They could be OK, Ardern reasoned at the press conference, provided they’re really schemes for water storage, and if the bad effects are mitigated. Details forthcoming. Apparently, Labour’s fierce pre-election complaints about WINZ didn’t really amount to a rejection of the punitive WINZ regime per se, but only had to do with the “frequency” of its use. Who knew? Yesterday, Ardern tried to clarify how (a) her previous qualms about WINZ and (b) what Jones is now proposing could still co-exist within the same time/space continuum. It would seem that the new government has had no objection in principle to what National were doing – or to whatever Jones may feel is needed to boot the nation’s idle youth off the sofa. The conflict is only over how often those punitive sanctions of yore will be imposed in future. And that, it seems, is still a work in progress. In the meantime, WINZ culture appears set to swing somewhere between a kinder, gentler form of maternal oversight on one hand, and a ‘Wait ‘til your Dad gets home’ level of ferocity on the other. Details forthcoming. Some leeway will also be allowed on socio-geographic grounds, as regards the application of the current array of WINZ sanctions. Shane Jones, Ardern indicated, is likely to be deploying NZF’s mooted forest planting schemes in regions like Bay of Plenty, East Cape and Northland where youth unemployment is an obvious problem. Surely, that should raise some health issues. It would be nice to know – given the regions cited and the lifestyle problems associated with chronic youth unemployment – whether extra money has been set aside for health and drug treatment facilities in those regions. After all, these are communities that lost swathes of jobs as a result of the policies and priorities of previous governments, and they’ve been ravaged by P and other drugs ever since. Surely, the youth at risk can’t be left to cop all the blame for the hiccups in their transition to the minimum wage work routines that Sgt. Major Jones has in mind. If tough love is to succeed, it will need to be tempered with sensible back-up drug treatment supports, no matter how much the stereotypical NZF voter wants to lay all the blame solely upon the youth of today. Can graphs make you angry? Someone contacted me about yesterday’s column, asking for more research links on the connections between corporate tax cuts, job creation and economic growth, or the lack of them. OK. See the details below. The last time Republicans obtained unified control of the federal government, after the 2002 midterms, they immediately set out to pass a large tax cut on dividend and capital gains income. The theory was that by making it more lucrative to invest in American businesses, they would boost business investment in the United States — making our country home to more factories and offices, driving job creation, and pushing up wages. What happened instead was a weak, highly in-egalitarian period of economic growth that was associated with the drift of America’s manufacturing base overseas and an unsustainable debt-financed boom in house building….Back in power, the new “populist” GOP is now pushing the exact same economic strategy. This time, instead of aiming to slash dividend and capital gains taxes that are levied on people who own shares of stock in big companies, they are directly slashing the corporate income tax paid by those companies. But the effect — by design — is exactly the same. The idea is that by making it more profitable to own American companies, you will juice business investment in the United States. The reality is that if we do the exact same thing we did when George W. Bush was president, we will likely get the exact same results — an in-egalitarian growth pattern, an uncompetitive currency that hurts American manufacturing, and an economy based on rich people lending money to middle-class people so they can buy houses…. Doesn’t that last bit sound familiar? “An in-egalitarian growth pattern, an uncompetitive currency that hurts [American] manufacturing, and an economy based on rich people lending money to middle-class people so they can buy houses.” In New Zealand as well, we’ve spent the last three decades in thrall to the same brand of market ideologues, with the same results. 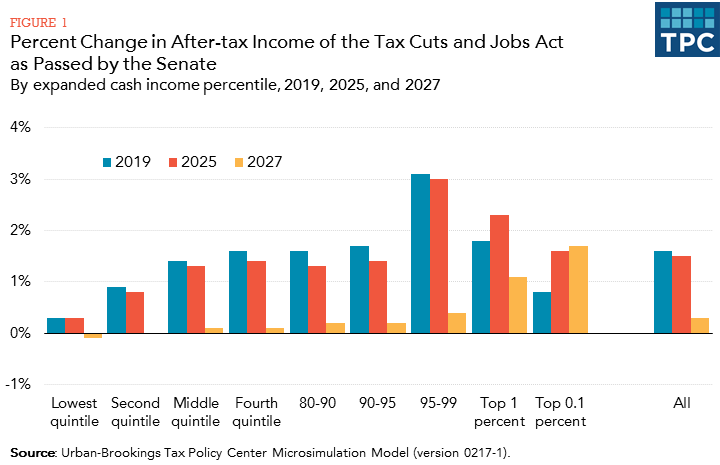 Finally, the graph on this page below compiled by the non-partisan Tax Policy Center shows just how outrageously the gains from the Trump tax cuts will be parcelled out – both now, and especially after 2025. Even the upper middle class will get shafted. Look at the huge gains, set to last forever more, for those earning above the 95th quintile. Look also at the huge and enduring gains for the one per cent, and for the top tenth of the one per cent – while the relatively paltry gains for everyone else get phased out from 2025 onwards. In effect, Trump’s GOP is saying that ordinary Americans (and especially their children) are of utterly no interest to the Republican party, unless they’re the heirs of family fortunes worth more than $5.49 million. In which case, only they will benefit as the GOP scraps the estate tax. There will also be tax breaks for the purchase and maintenance of private jets and luxury yachts, even as schemes for health coverage of poor children are cut back as unaffordable. Truly, you can’t satirise this stuff. Where is the Occupy movement, now that we need it again? Drive a family from their home..